The many shades of blue ! The American corporate world’s “power dressing” has unfortunately influenced the corporate world everywhere and reduced the colour palette to just pale blues and whites. I wish men and women start wearing other colours too – its a colourful world out there and of course Indians are blessed with a rich heritage of handloom products. 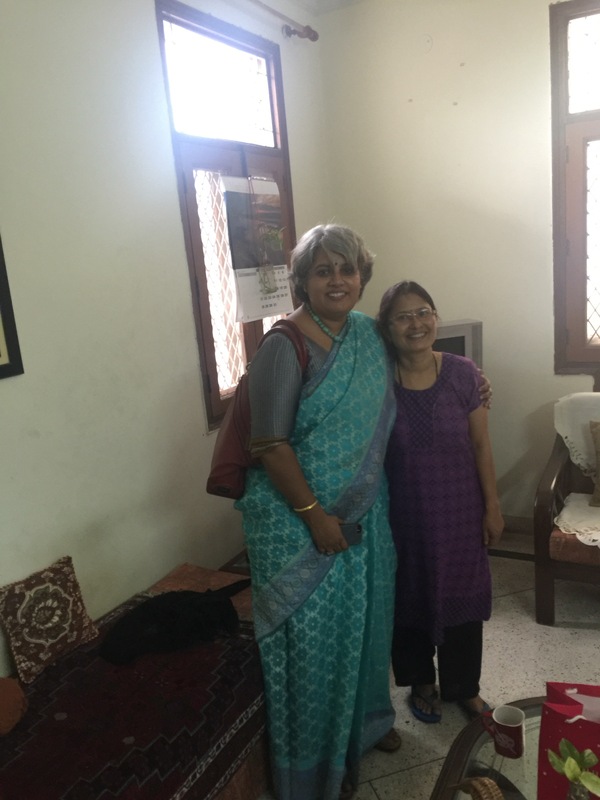 I have never worn anything except saris to work since 1989… except for a couple of years that I worked with Pizza Corner where I had to wear the uniform (Green pants and Red T.Shirts). I loved that place so had no issues with wearing the uniform. Guess subliminally I was also feeling good about wearing the dark green (Olive) pants because the color was close to the color of the Indian army’s uniform. The picture below is a lovely Lucknowi Chikankari sari. This was bought at SEWA, Lucknow some ten years back. The neckpiece is Lapis Lazuli beads from Desh Maheshwari, Noida. Just look at the intricate chikankari (done by hand) and the intricate appliqué work. This is as formal as it gets, with no bling and a very corporate blue. 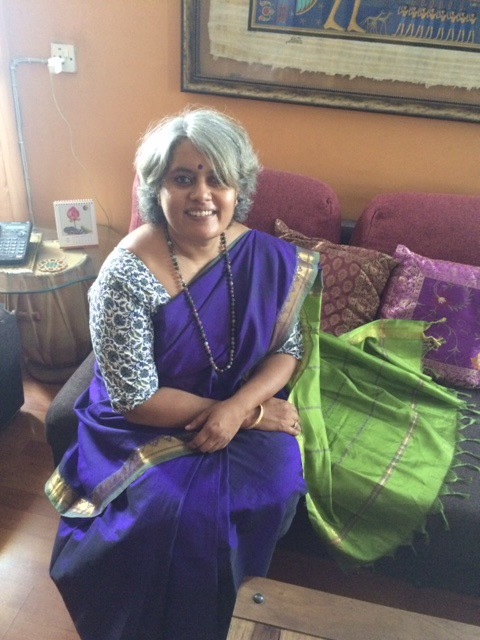 The sari in the picture below is a peacock blue or royal blue. People who studied in Kendriya Vidyalaya in the 70s and 80s would know this colour intimately as it was the color of the ink that filled our ink pens!! 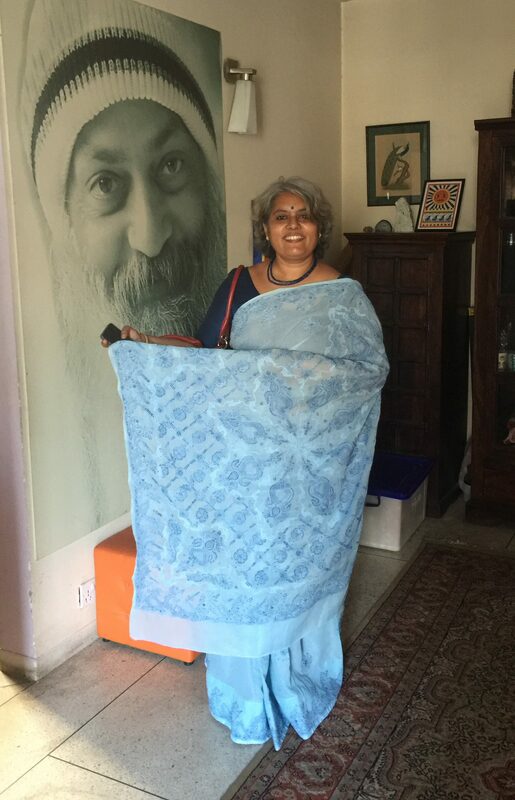 This sari for me is special, because its a gift from Vidya’s mom. Its cotton-silk with a small Zari border in bright green. Just plain with no other design. one of my favourite shades of blue and amongst my earliest cotton-silk saris. 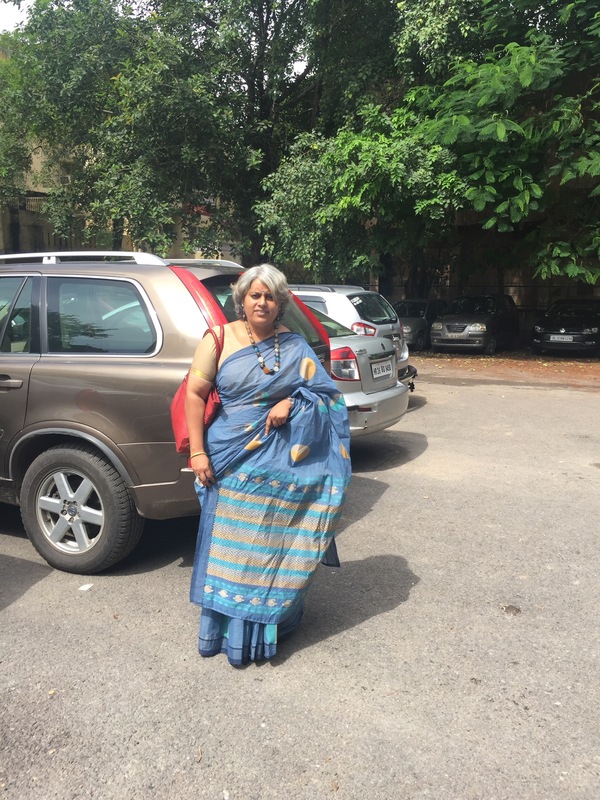 The sari in the picture below is from Nalli’s. Its an organza silk that they roll onto a thick wooden pole. Krishnan bought this for me and I wasn’t sure if I could drape it well since it has a papery feel, but in reality it actually drapes well. The benarasi motifs are lovely. The little girl in the picture with me is Nishi, my classmate since 7th standard. She still looks like she can get back to school and no teacher will figure out that she is older :). And her classmates will have a tough time getting her out in a dodge ball game or a game of kho-kho. While this sari maybe a bit dressy, but its not over the top and if one doesn’t over-accessorize, then its quite a corporate kind. Amazing shade of blue … copper sulphate blue ? What can men do ? Well, for one, expand your colour palette – all colors are corporate colors…. and hey, diversity I thought is the buzz word!. There are linen shirts available in very beautiful colours and even the big brands have lovely striped, checked and plain shirts in all colours. Go on and dress formally in colours other than blue and white, the world out there has changed. Girl friends – the sari is as formal as it gets. Start wearing one to work today. Enjoy the beautiful colours and different weaves and try and get a few handloom saris because then, you are helping a weaver sustain himself and his craft. Happy Monday folks. May the day be expansive as the blue skies.